How many planets can we see with a naked eye? Five! Mercury, Venus, Mars, Jupiter and Saturn can all be spotted from Earth without the aid of a telescope or binoculars. Though in principle all five are visible, some are easier to find than others. Mercury is the trickiest planet to observe thanks to its small size and proximity to the Sun. Telescopic observations of the planet face the same problem. But it is not only difficult to observe Mercury from the ground. Sending robotic explorers to the tiny planet is also tricky. Mercury is very fast. It is very energy consuming to get a spacecraft into orbit around Mercury. The amount of propellant needed could have taken you all the way to Jupiter (though Jupiter is 12 times farther away from the Earth than Mercury). Another challenge is the radiation from the Sun. Any spacecraft daring to get so close to our star will have to have a one of a kind heat protection to operate! Unsurprisingly, Mercury is the least explored terrestrial planet in the Solar System. Our knowledge of it is very patchy and far from complete. Still, Mercury is a very interesting object and we want to study it despite all the difficulties. Yes, it is not surrounded by a swarm of moons. There are no rings, And it is unlikely that we will find any living things there. But this little planet can tell us a lot about our Solar System and explain how planets orbiting close to their stars form and evolve. It is the closest planet to the Sun, but only the second hottest! Still, the temperature swings from -173 degrees at night to +427 degrees during the day, that is the biggest temperature variation we know of! 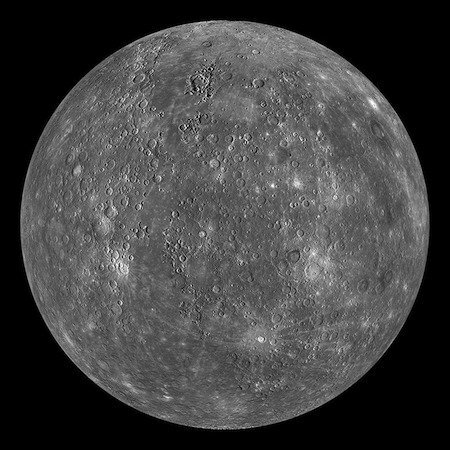 We used to think that Mercury is tidally locked with the Sun the same way the Moon is tidally locked with the Earth, completing one revolution per orbit (and having the same side always facing the Sun). But it turned out that it’s spin-orbit resonance is 3:2, meaning Mercury spins 3 times for every 2 orbits around the Sun. Mercury has a huge core that takes up more than 40% of the planet’s volume Moreover, it might be (or at least a part of it) still liquid, despite all the classic theories that a small planet ‘s the core should cool down and solidify quickly. But it is cooling down all right causing the planet to shrink! Mercury is now 7 km smaller than it used to be! Most Solar System planets orbits are nearly circular, but Mercury’s orbit is quite elongated. The orbit’s eccentricity is 0.206 (in comparison, for the Earth the value is 0.0167). Moreover, the oval of the orbit slowly changes orientation (this is called perihelion precession)! In fact, it is true for all planets, but only in case of Mercury the rate of rotation predicted by classical mechanics fails to match the observations. This is because the planet is so close to the Sun, that we have to take relativistic effects into account. Mass warps the space, right? Only Mercury is so close to the massive Sun that we can actually see it! How cool is that? Mariner-10 was the first ever mission to reach planet Mercury. The spacecraft was launched in 1973. 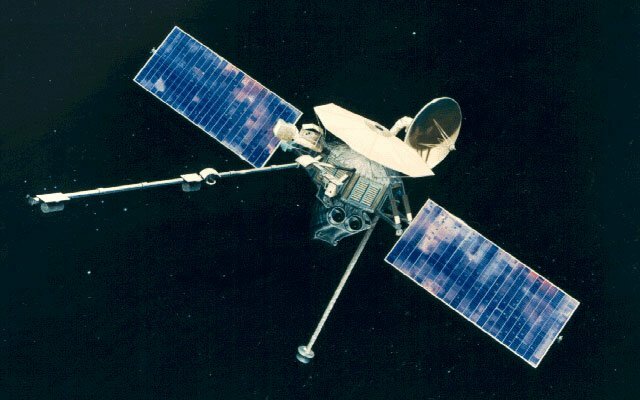 To get to the correct orbit Mariner-10 used the gravitational slingshot technique (i.e. the gravity of Venus and not propellant) to change the course, the calculations for this manoeuvre were first done by the Italian mathematician Giuseppe “Beppe” Colombo. The spacecraft performed a flyby of Venus in February 1974 followed by three flybys of Mercury in 1974 and 1975. Mariner-10 is probably still orbiting the Sun. The mission changed the way scientists thought of Mercury. It revealed the presence of thin atmosphere, magnetic field and detected huge temperature variations on the surface. Over 3000 photographs made by Mariner-10 showed a Moon-like surface, featuring craters and scars. Mariner -10 mapped about 45% of the Mercurian surface. Another NASA mission to planet Mercury, Messenger (MErcury Surface, Space ENvironment, GEochemistry, and Ranging), was launched in 2004. The spacecraft performed one flyby of the Earth, two flybys of Venus and three flybys of Mercury before it settled on Hermean orbit for a year. 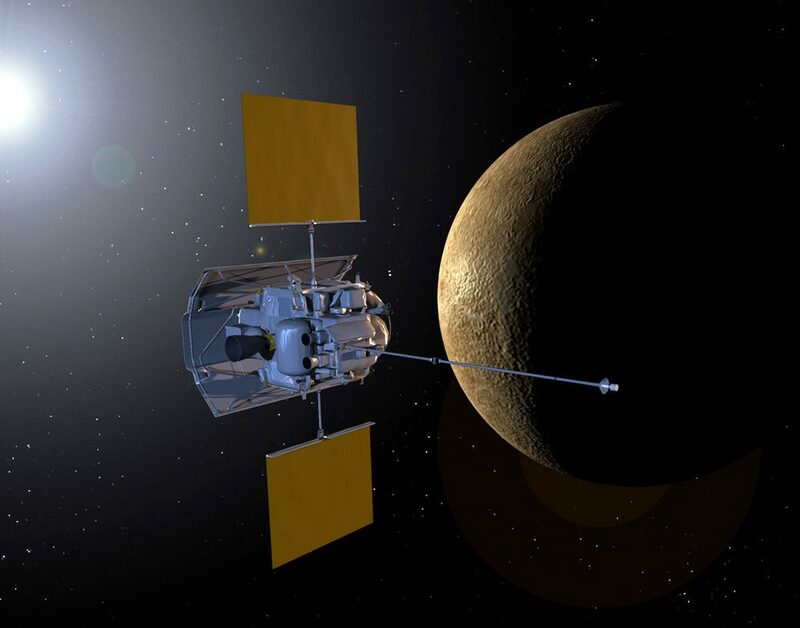 Messenger was the first (and still the only) spacecraft to orbit planet Mercury! It crashlanged on the planet in 2015 after it ran out of fuel. Messenger’s mission was a big success. It provided scientists with images and date that are still being analyzed and processed today. Among the mission’s main achievements are: mapping 100% of the surface, discovery of an unusual shape of the Hermean magnetic field (it is offset to the North), discovery of the water ice and organic compounds in the craters on the North Pole. Up to date only these two spacecrafts have visited planet Mercury (in comparison, tens of orbiters and landers have been launched toward Mars and Venus). But if you have recently been to the Science Museum in London you might have spotted their new new exhibition: BepiColombo Thermal Structure Model. This is a model of a new spacecraft that in a few months time will be on its way to Mercury! BepiColombo (guess who the mission was named after?) is a Mercurian orbiter designed and built by European Space Agency (ESA) and Japan Aerospace Exploration Agency (JAXA) . It is scheduled to launch in October 2018. BepiColombo is in fact two spacecrafts, JAXA Mercury Magnetospheric Orbiter (MMO) and ESA Mercury Planetary Orbiter (MPO), that will separate upon arrival to Mercury, about 7 years after the launch, and carry out their own experiments. Originally, scientists planned to add a small lander to BepiColombo, but that part of the mission was unfortunately cancelled. With the help of BepiColombo scientists hope to learn more about Mercury’s structure, composition, explore the variety of surface features, study the planet’s magnetic field and magnetosphere and also Mercury’s bizzare atmosphere. So the little planet might eventually reveal its secrets. Soon. In seven years or so! Let our space dome team know if you have any questions!